Every winter in Provence between mid January and mid February is a very exciting time for lovers of fine food. This is truffle season, full of fevered activity, colourful characters and Machiavellian mischief. To one side of the colourful weekly market in Carpentras with its olives, sausages, cheeses, vegetables and household goods a crowd gathers, people jostle and the atmosphere is conspiratorial with whispers and surreptitious glances into baskets and plastic bags. People sniff, grunt and feel the wares before scales are produced and significant sums of money changes hands. The object of all of this activity are what appear to be small lumps of dirt. In fact they are the aromatic and highly prized Tuber melanosporum, the Truffle or "Black Diamond" of Provence. 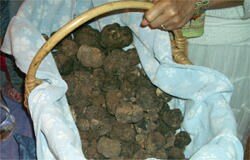 Quality truffles will bring well over US$3000 per kilo! Truffles almost exclusively grow on the roots of oak trees in a very few regions of Provence and the Perigord. There are other varieties that grow in Italy and other countries but have a lesser flavour and aroma compared to the Provencale specimen. In the past pigs were used to help find truffles because of their acute sense of smell but they have now been replaced by dogs who unlike the pigs are easier to handle and not hell bent on eating the prize. There is a lovely story from the Perigord about a man who found to his horror that his prize truffle pig had broken out of its pen and gone on a truffle eating spree - quelle horror! Truffles are left in their covering dirt to help preserve them after harvest and they last for 3-4 days before starting to loose their aroma and flavour. One of the best ways to enjoy truffles is to make an omelete with lovely fresh farm eggs and add slivers of fresh truffle - absolutely delicious.